This post contains excerpts from Chapter X, True Initiatory Levels in Alchemy & Magic, from Practical Alchemy: Path to High Alchemical Arts. Furthermore, viewpoints shared here are based upon universal alchemical levels that reflect and align with the practical work itself, not with reaching a level or attaining a title within any temporal spiritual organization. 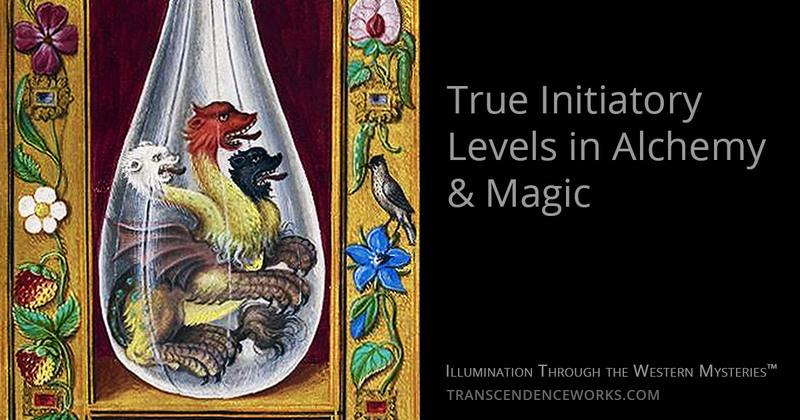 True initiatory levels in alchemy and magic progress from Initiate, to Adept, to Master, through a process reflected in the stages of practical alchemy itself. Adepts have said that for true initiation either one must have a teacher or have the intercession of divine inspiration, which basically means instruction from a nonphysical intelligence. Either way one still has to have a teacher, or be taught by someone who had a teacher that was an adept, to get to a certain point where one can then pick up one’s own inner teacher. Much of the Way is not intuitive; in fact, it is actually counter intuitive so it is very difficult to say, “Oh, I can just try to figure it out.” That is highly unlikely without some kind of proper instruction, at least in the beginning; however, incredibly intelligent people still set about attempting to force the lower mind into deciphering how the enigma of alchemy is solved, and fail continuously. It is not necessarily about intellect, though that is useful, it is only a part of the issue. Another part of it is, if this is not the lifetime where one is supposed to succeed in completion the Art, it is not going to happen: It is up to one’s Higher Genius. The Higher Genius is the one that determines how many incarnations one has and whether enough has been learned for what is needed to be able to complete that level—to fulfill one’s capacity as a human being and evolve to the next level. The Higher Genius is the one orchestrating that. All we can do is put our best foot forward and keep making real effort. If one is not ready to complete the work all the way through to the Philosopher’s Stone, one can still complete portions of the work. If one has evolved far enough, developing the ability to communicate and negotiate with the Higher Genius and say, “Okay, what do I have to do?” becomes possible. Basically, it is an alignment process. There is an alignment and a surrendering of personal will, which is basically the highest use of personal will that is actually useful: To surrender it to the Higher Genius of one’s own free will. Most everything else people run around thinking they are doing with their will is really just getting in their way. A lot of people have figured that out, but they have not really figured out what to do about it. It is because they have not been taught to communicate with the Higher Genius, in a way that is very certain that it is really the Higher Genius. A lot of people talk to a lot of things, though they are not necessarily the higher aspects of what they think they are. Most often they are just aspects of the intelligences in the psyche. There is a protocol for how those things are dealt with in proper training to be certain, and many have not had access to that level of training. When directing one’s journey into true initiatory levels in alchemy and magic, the same process is reflected in the inner alchemical (magical) work as it is in the outer laboratory work. They are both long, arduous, and difficult. One does not think, “Oh, I am just going to float around in the ethers in my imagination and I am just going to visualize that I have done the Great Work and then because I have done a visualization that is really what is going to happen.” It does not work that way. Though those skills may be used at certain times, if it were as ‘intuitive’ as all those who claim to have deep intuition would like to believe, many more people would have a far more accurate understanding of real alchemy. The outer work is sometimes more intuitive than the inner work, from a certain point of view. Effectiveness in these things requires initiation on some level. In alchemy and magic, the way it was taught to me and the definitions that I have come to accept because of the way they align with alchemical principles, are as follows. The initiate alchemist has received instruction from an adept as a direct student, has been taught the correct overall process of the work, been given most of the keys (not all), and is working towards adepthood through confection of quintessences which bring about integrations of consciousness that allow communication with aspects of the Higher Genius. An initiate magician has received instruction from an adept as a direct student, has been taught the correct overall process of the work and been given most of the keys (not all), has been brought through specific training that affects his consciousness, and is working towards adepthood through specific inner work processes which bring about integrations of consciousness that allow one to communicate with aspects of the Higher Genius. An adept alchemist has been instructed by a master or within the master’s lineage under another adept, possesses full keys to the work, is a true initiate, and is in the process of working towards completion of the Stone. Now, possesses ‘full keys to the work’ does not mean that every single thing has been spelled out in painful detail. More like nothing has been left out of the explanation in mostly broad strokes, and then some finer strokes, but there are things one is going to have to figure out. It is not just going to get handed over without real work. Same thing with the adept magician who has been instructed by a master or within the master’s lineage under another adept, possesses full keys to the work, is a true initiate, and is in the process of working towards completion of union with the Higher Genius. Again possesses full keys to the work is broad strokes, not every little thing is spelled out. A master alchemist is a person that has achieved production of the true Philosopher’s Stone. He can perform all of the works with which the Stone can be made to do. He could not have achieved production of it unless he understood all of the aspects of the work that are required in order to be able to do that. A master magician has achieved full union with his Higher Genius and can perform all the works that can be achieved from that state of consciousness. The master magician has learned the inner work; however, just because he has learned the inner magical work does not mean he just automatically knows how to do the outer alchemical work when he gets to a certain level. He might have a better idea, but unless he has been directly taught he does not really know the specifics… though he can certainly explore that particular path far more easily than most. The same thing happens to the master alchemist as the master magician, the difference being that the alchemist has the Philosopher’s Stone from which is made the Elixir of Life, which when ingested connects one to those powers attained in mastery of inner magical work (extensions of the Higher Genius). So he does not need to go learn all the inner mechanics that the magical seeker had to learn in order to become a master. That is because those aspects come about as a by-product of ingesting the Elixir made from the Stone itself; that is what the Stone does, or rather, that is part of what it does. Each of these paths have their strong points, depending upon personal affinity, but the ultimate purpose of either path is evolution, to communicate and merge with one’s Higher Genius. There is no way to circumvent the necessity to learn to properly communicate with one’s Higher Genius to evolve spiritually. It is a barrier placed by Nature. That gives an overview for levels of attainment and understanding within alchemy and magic, from this particular Hermetic point of view, delineating what the true initiatory stages and steps are. It is not about self-dedicating and doing a little ceremony; there is none of that in real alchemy and even in real magical work there is honestly very little of that. Studying under an adept is really more like: “This is the way it is, and this is what you need to know. Now go do it.” There is a little bit more in the explanations, but there is no pomp and circumstance. True adepts care little for pageantry. It is up to the pupil to do the work after that. If one does not make any progress, then the adept just does not pay attention anymore. Time spent on someone who is not really serious is just time spent away from everything else. Adepts have to prioritize their time just like everyone else. A cohesive working framework for both the magical and alchemical traditions, and the way that they parallel and intersect each other, is helpful to create an useful context in which to approach either one. Although the most effective training incorporates both, regardless of what path a Seeker is drawn to follow, it is important to have a clear understanding of how the main paths interrelate. When I speak or teach using those terms, those are the definitions that I use. In addition to online courses that will be offered here in the future, Seekers interested in the initiatory Western Mystery paths may wish to explore private training options as they are available.